Hamburg, 13 June 2018 – SAL Heavy Lift repeats success by signing contract for shipment of a total of 49 transition pieces for the Horns Rev 3 Offshore Wind Farm. The contract has been signed with GeoSea NV, and underlines SAL’s performance and significant track record in the technical heavy lift transport market for complex offshore wind projects. Once again, SAL Heavy Lift is proud to announce another success in the offshore wind project market, by signing the contract for transporting 49 transition pieces (TPs) for the Horns Rev 3 project. The assignment compiles transportation of TPs from fabrication yards in Aalborg, Denmark and Vlissingen, Netherlands to the project port of Esbjerg in Denmark. SAL’s ability to meet a very demanding project schedule made the decisive factor for GeoSea. Within a very short time, SAL must prepare a full HSSE and Quality plan, create the technical design and finalize the engineering work, execute procurement as well as fabrication of five TP grillages and one lifting tool and get the vessel ready to load the first units. GeoSea NV awarded SAL the job, following the contracting of the ongoing Hornsea Project One offshore wind farm project which SAL also undertake for the Belgian marine engineering house. This project follows an already extensive list of similar projects that SAL Heavy Lift has executed for construction companies within the offshore wind industry. 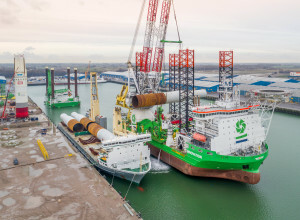 Starting with the transportation of 68 transition pieces (TPs) to the Veja Mate offshore wind farm in the summer of 2016, following a long engagement transporting 87 monopiles (MPs) and TPs for the Walney Extension offshore wind farm into mid-2017, up to the recent transport of 174 MPs and 68 TPs for Hornsea Project One shows a significant track record in this business segment. Now SAL’s MV Lone will conduct the TP transport for Horns Rev 3. Each of the 49 TP’s measures 32,27m in height, has a dimension of 7,12m and has a unit weight of 530t. The project will start early July and run for a period of approximately 65 days. SAL Heavy Lift, a member of the Harren & Partner Group, is one of the world’s leading carriers specialized in sea transport of heavy lift and project cargo. The company was founded in 1980 as “Schiffahrtskontor Altes Land GmbH & Co. KG” and belongs to Harren & Partner Group since 2017. The modern fleet of heavy lift vessels offers highly flexible options to customers. The vessels of SAL Heavy Lift boast an impressive travel speed of 20 knots, up to 3500 square metres of unobstructed main deck space and combined crane capacities ranging from 550 to 2000 tons: amongst the world’s highest lifting capacity in the heavy lift sector. As a leading global company in the heavy lift and project cargo segment, the company meets the highest standards with regard to quality, technical innovation and health, safety and environment.